This place has always been my Go-To for glasses! The customer service here is the BEST, they’re always friendly and very helpful which is what’s important to make a customer feel welcomed. Ask for Rocsana! Took my daughter in for a checkup. Great staff and Dr. Tran was very thorough. He explained everything and even taught me and my kids a few extra things about eyes and how they work! Great experience and my daughter can’t wait to get her new glasses! Thanks Dr. Tran and staff!!! The Doctor was very detailed in my examination did leave me in his staff hands. He directly attended me i am happy I found this doctor. I also was given a warranty on my glasses which I certainly needed. I had my regular eye exam with Dr. Tran. I totally loved all the information/explanation he gave me regarding the health of my eyes. I am in my forties and I have never run across such great detailed explanations with examples. My previous experiences it usually goes like “this is what it is…do you have any questions?” Most of the time I felt like the Dr. was rushing me out bc there was another patient that was waiting & I didn’t know what to ask right there & then. I have 14 year old twins and I obviously brought them to Dr. Tran for the eye exam. My kids are the type you can’t just tell them “you need to wear your glasses all the time” and that is that… They are at that age where they think they know it all 🙁 . Dr Tran took the time and explained eye health in a way that kept them interested and I do not have any issues with them wearing their glasses anymore. My youngest son has his exam coming up in the next couple of months and I’m definitely bringing him to Dr. Tran. I made our appointments for after school & we were seen within 10 minutes of our appt time. I do not know how long they have been at this location but their office is very clean and the ladies that check you in/out and assist you with the selection of glasses were very professional but friendly at the same time. Always with a smile and very patient with my indecision of what/which ones I wanted. Great customer service. ..very helpful doctor..definitely refer them to anyone looking for an eye doctor. I have seen both Dr. Mikkelsen and Dr. Tran in my time as a patient at TSO, and they are both fantastic! I’ve always been seen promptly and have had a pleasant experience from the time I walk in the door until I leave. Both Dr. Mikkelsen and Dr. Tran take the time to explain every detail of the visit, including what future issues might come up and what to keep an eye out for (no pun intended). 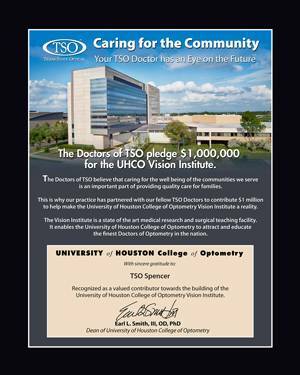 Of course, visiting a doctor of any kind is usually not the highlight of anyone’s day, but TSO truly makes eye exams a delightful experience. The staff is super friendly and helpful. Cindy sat down with me after my visit with Dr. Tran and went through every line item of what I was to pay, and what my insurance covered. I recommend this location to everyone I know who is looking for an eye doctor, including my fiancé. Great work, TSO! Great service. Thank you Priscilla and the team at Pasadena TSO. Very happy! First time getting my eyes checked in years. Wait was a little long, but after I got checked in it few by. My lady was very patience with me. I cannot remember her name I think it starts with A and she wears Tory burch glasses! She helped me pick out a perfect frame and gave me amazing deal. Like I mentioned before it was my first time she didn’t seemed bothered by the hours with spent together . Very helpful and sweet staff. Jerome did a great job of fixing my glasses! The price was reasonable and he took his time and got it right! Been coming to this office for over 5 yrs for me and my son. The office staff and the Doctors are always nice and demonstrates excellent customer service! Check them out. LUV this office, been coming here for more than ten years. My mom started bringing me here since I was in my teens, now I bring my four kids every year for their checkup. With the staff changes thru out the years, I could not say I have not had one bad experience in this office. Staff and the doctors are nice, professional, and with the insurance changes thru out the years they always helped me understand my insurances, and even let me use my husband’s and my own insurance at the same time. I recommend this office to my family and friends. GREAT JOB TSO ON SPENCER!!!!! I have been coming here to this location for over 3 years and every time all the staff have been very nice and Dr. James Mikkelsen makes every visit very comfortable for me. They have always been very attentive and the place is very clean. I recently went to the TSO off of Spencer Hwy in Pasadena, and so was pleased with the service I received! The staff and optometrist Dr. Mikkelsen was so nice and very professional. The doctor gave me a thorough exam, and sat and talked with me and explained and showed me my 3D exam that you can now do instead of having your eyes dilated. I highly recommend it. After getting my prescription done, I was able to choose from a wide variety of frames. I didn’t feel rushed and any questions I had, the staff was quick to answer. I highly recommend the TSO at this location. Next time I need to get my eyes checked and get new glasses, I will definitely be going back there. Thanks, TSO! Can’t think of any way they could be better! My appointment was very pleasant, the staff was amazingly helpful and kind. I will definitely be returning. Felt as if I received a very thorough exam. The staff seemed to be very helpful. Was very pleased with the visit. Thanks. I made the appointment with my 3 children as well as myself. The staff as well as the Doctor were very patient and kind to my children. Dr. Tran made sure we understood everything before we left the office. This Doctor was great. It seems you got new employees and they are so much nicer and friendlier than the last time I went a few years ago. Aracely did a great job in assisting my frame purchase. She was knowledgeable and very patient. Love the Doctors and staff.